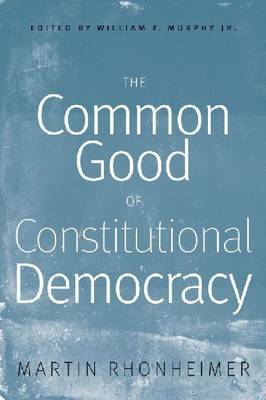 The Common Good of Constitutional Democracy offers a rich collection of essays in political philosophy by Swiss philosopher Martin Rhonheimer. Like his other books in both ethical theory and applied ethics, which have recently been published in English, the essays included are distinguished by the philosophical rigor and meticulous attention to the primary and secondary literature of the various topics discussed. Rhonheimer takes up the unfinished agenda of the Second Vatican Council's Decree on Religious Liberty, Dignitatis humanae, and makes many significant philosophical contributions relating the Catholic tradition to modern and contemporary political philosophy. He begins with an argument for why political philosophy is necessary, especially in light of the democratic constitutional state and the culture of human rights. He addresses many disputed questions, including ones about autonomy, the common good, secularism, multiculturalism, the relationship between authority and truth in civil law, and the role of the state in the economic sector. In so doing, Rhonheimer engages the entire tradition from ancients like Plato and Aristotle through contemporaries including Rawls, MacIntyre, and Taylor. The volume includes a detailed introduction by William F. Murphy Jr., locating this collection in Rhonheimer's broader body of work and within the field of political philosophy. This book will be an invaluable resource for Catholic philosophers, moral theologians, political philosophers, and other religious thinkers looking for philosophical resources to relate their traditions to the modern state.